→ Love what you do and success will fall in love with you. → Love your customers and they will love you back. is the umbrella term used to describe the method – position in the → value chain, customer selection, products, pricing – of doing business. lays-out the process by which a company actually makes money by specifying how it is going to charge for the services provided. 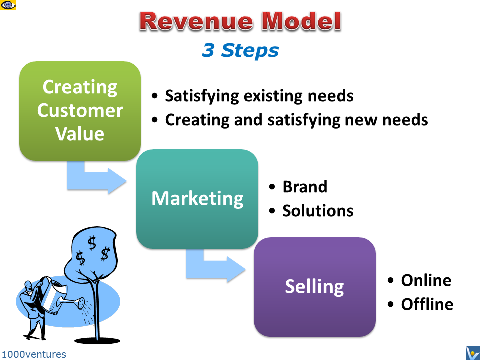 A revenue model is the system design by which a business monetizes its solutions, products, and services. Being a key component of a → business model , a revenue model is the business plan for an enterprise to make money. It describes how a business generates revenue streams from the → value it creates for customers. The business in the digital economy is evolving and companies are responding to the → new business environment. The accelerated development of the Internet, → social networks and mobile devices is expanding the possibilities for revenue generation. Some companies are using new e-commerce technology and the Web. Others are creating niches within market segments. Some are selling complementary products and services, while others are experimenting with new ways to generate or supplement revenue streams. These new approaches offer new possibilities for innovative firms and serve as leading-edge examples of strategic thinking, → entrepreneurial creativity , and partnering opportunities. Internet, e-commerce, contextual advertising, social networks, mobile banking and numerous other e-innovations gave rise to new kinds of business models as well as reinvented old tried-and-true models. In the most basic sense, a → business model is the method of doing business by which a company can sustain itself – that is, generate revenue. The web changes traditional business models.